Pipes are 5 foot lengths only. 3"-12" is 22 gauge galvanized & 14"+16" are 20 gauge galvanized. Many other sizes of Clamp Together ductwork available, call 800-367-3828 or email sales@airhand.com for quote. Clamp Together Clamps provides quick and easy connections for Air Handling Systems Clamp Together Pipe and Fittings. Clamps come standard from Air Handling Systems with Nitrile seals and bridge pin for locking clamp into closed position. Galvanized supplied with galvanized bridge pin. 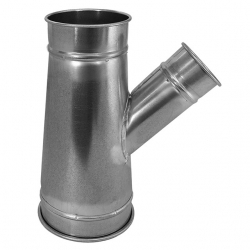 Many others sizes of Clamp Together Ductwork available, call 800-367-3828 or email sales@airhand.com for quote. 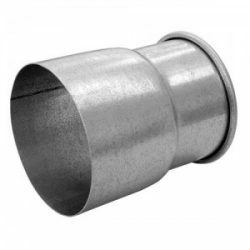 Lateral Saddle Tap Tee - Perfect Clamp Together (CT) solution when adding a machine to an existing system by simply tapping into existing pipe by cutting hole and pop riveting the saddle over the opening. It is important that you have the air volume (C.F.M.) for the new opening. Many other sizes of Clamp Together Ductwork available, call 800-367-3828 or email sales@airhand.com for quote. Y Branch - Ideal fitting for proper airflow when connecting two branches together and can be made with various diameter branches. 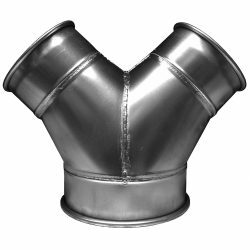 As with our Tees, Clamp Together (CT) Y Branches are built to industrial standards of 20 Ga. galvanized steel; fully welded, airtight. Many other sizes of Clamp Together Ductwork available, call 800-367-3828 or email sales@airhand.com for quote. 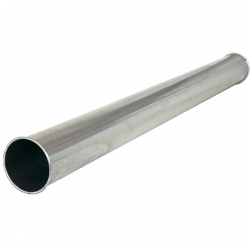 Tee on Taper - Airtight, fully welded, stronger than competitor’s products. Clamp Together (CT) Tee on Tapers are needed to reduce static pressure in your dust collection system and improve performance. Tee on Tapers are used in locations where the combination of Lateral Tee and Reducer may be planned. A = Largest End Diameter; B = Opposite Smaller End Diameter; C = Branch Diameter. 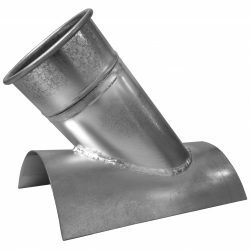 Click here for Tech Data on Clamp Together Tee on Taper same as our standard Tee on Taper Many other sizes of Clamp Together Ductwork available, call 800-367-3828 or email sales@airhand.com for quote. 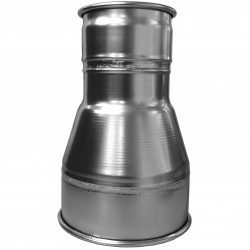 Spun Reducers - Perfect solution for enlarging or decreasing the duct size in order to gain efficiency in a properly designed system with Clamp Together (CT) collars. Many other sizes of Clamp Together Ductwork available, call 800-367-3828 or email sales@airhand.com for quote. Clamp Together Die-Stamped Elbows, are stronger than most competitor’s products. 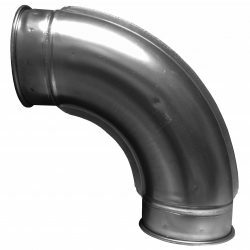 Airtight, welded elbows die stamped are available in 45 degree and 90 degree. 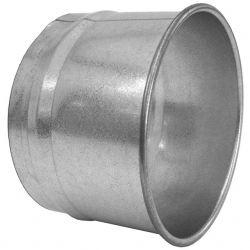 The die stamped elbows run from 3" to 14" and are fabricated from 20 gauge galvanized steel. Centerline Radius (CLR) is 1.5 x di­am­e­ter. All elbows have a smooth obstruction free interior. Many other sizes of Clamp Together Ductwork available, call 800-367-3828 or email sales@airhand.com for quote. Balance air going from one branch to another. By closing an idle machine’s gate, air will be diverted improving system effectiveness. 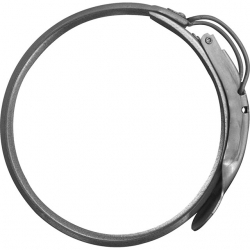 Constructed of aluminum castings with a galvanized steel slide blade with clamp together collars. 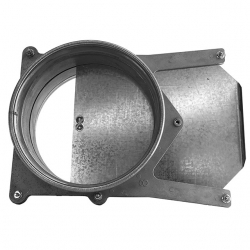 Many other sizes of Clamp Together Ductwork available, call 800-367-3828 or email sales@airhand.com for quote. 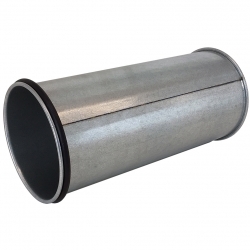 Clamp Together Hose Adapter - HOSEAD-CT provides connection from Clamp Together (CT) ductwork to flexible hose. Hose end is beaded to help retain hose with the hose clamp. Many other sizes of Clamp Together Ductwork available, call 800-367-3828 or email sales@airhand.com for quote. Clamp Together Machine Adapter allows for easy connection of clamp together duct work to machines requiring dust or fume removal. 3"-12" 22 gauge. 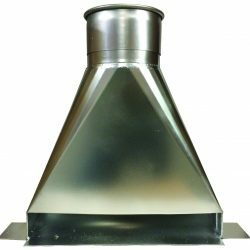 Sized +1/16" ID (.0625") in the expanded version.Many other sizes of Clamp Together Ductwork available, call 800-367-3828 or email sales@airhand.com for quote. 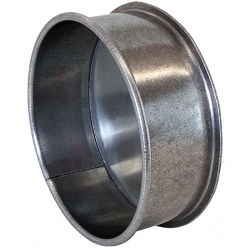 End Cap - End Cap with Clamp Together (CT) collar to cap off the end of pipe or fitting. 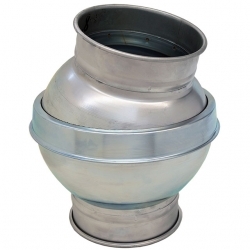 Many other sizes of Clamp Together Ductwork available, call 800-367-3828 or email sales@airhand.com for quote.